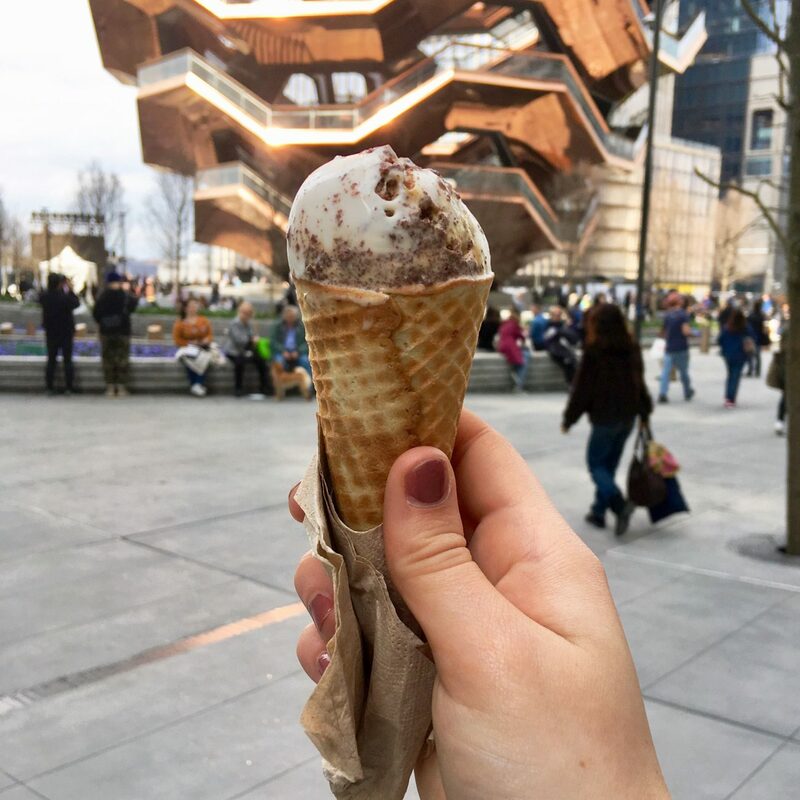 I had seen a few YouTube videos recommending Van Leeuwen ice cream but we hadn’t planned on being near any of their shops which is surprising because they have many throughout New York (and also in Los Angeles, my two favourite places in the world). 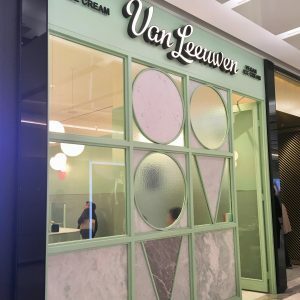 We heard on the news one morning that there was a new mall/neighbourhood/entertainment centre kind of thing called Hudson Yards opening later that day and I just happened to hear ‘Van Leeuwen‘ and realised it was the vegan ice cream place. Not everything is vegan but they have some pretty exciting vegan options so naturally I made time in our day to go along because I love a vegan ice cream. 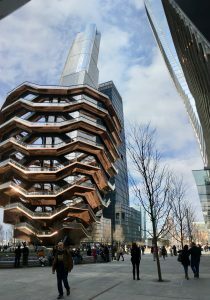 We found it hard to find to begin with because there didn’t seem to be a pattern to where the food places were but we just kept walking around the mall and eventually found it (it had only been open to the public a few hours so Hudson Yards can be forgiven for that I guess). They have a lot of inventive vegan flavours (think ‘cookie crumble strawberry jam’ and ‘peanut butter choc chip’) and they even have vegan chocolate sauce and whipped cream! 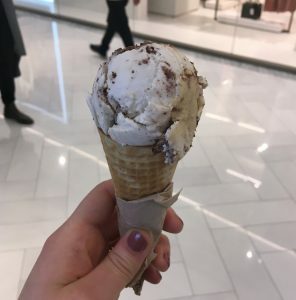 All the vegan ice creams are made with cashew milk, coconut milk, coconut oil, cane sugar, cocoa butter and carob bean in Greenpoint, Brooklyn. You can taste the coconut slightly but it’s one of my favourite flavours so that’s absolutely fine by me! It seemed like there were two types of cones and one was vegan but do check if you go. I went for the cookies and cream caramel swirl and Billy had choc chip cookie dough. It was really tasty and had a good mix of all the flavours I was expecting. It was very creamy and I even liked the cone. I usually consider the cone as simply the holder for the ice cream. The staff were really friendly and knew what they were doing despite it being the opening day. We didn’t look around the other food available in Hudson Yards becaus it was so busy but there is a Sweetgreen which I believe does vegan food and there’s bars and coffee shops too. Outside is the ‘vessel’ which is kind of a mix between art and an attraction. I’d probably compare it to the ArcelorMittal Orbit at the Olympic park in London (fun fact – I worked on the opening ceremony in 2012 and walked past it every day). You can apply for tickets to walk up it but we’d done so much walking already that I don’t think it would have been enjoyable. We sat down outside and enjoyed our ice creams and the atmosphere and we also got given some fake tattoos of the vessel which was weird but I’m totally gonna do one for the fun of it. We didn’t stay that long because we hadn’t planned on going in the first place and we were seeing a show later but it will be interesting to go back when the other buildings are finished as they were still building when we went.